The State University of New York recently announced $710,000 was awarded for the first round of funding from the SUNY Materials and Advanced Manufacturing Network of Excellence, which aims to support the state's manufacturing sector by bringing faculty and student researchers together with industry experts to spur the development and commercialization of their work. Nine collaborative projects on seven SUNY campuses received funding. Six of the nine collaborative projects to receive funding from SUNY involved students and faculty from the College of Environmental Science and Forestry (ESF). $175,000 for Therapeutics: This project aims to enable personalized treatment of diseases and injuries through large-scale manufacturing of advanced biomaterials. Dr. Ivan Gitsov, ESF Department of Chemistry, collaborated with faculty from the University at Buffalo, Binghamton University, SUNY Polytechnic Institute and Stony Brook University. $60,000 for Green Materials and Manufacturing: For this project, SUNY campuses will engage corporate partners to submit a competitive proposal to establish a Clean Energy Manufacturing Center in New York State. Led by Dr. Christopher T. Nomura of the ESF Department of Chemistry, and involving Gitsov and Dr. Mark Driscoll, university instructional specialist, the group also worked with SUNY Albany, Binghamton University and Stony Brook University. $15,000 for Characterization: This project will facilitate online access to a database of more than 250 laboratory resources and advanced materials testing and analysis equipment across the SUNY system. The database will contain information about each piece of equipment as well as contact information for local experts who can advise about their use. David Kiemle, ESF's nuclear magnetic resonance and mass spectrometry specialist and director of Analytical & Technical Services, partnered with faculty from SUNY Polytechnic Institute, Binghamton University, Stony Brook University, University at Albany and University at Buffalo. $40,000 for Manufacturing Technology: Participating campuses will partner with industry representatives to expand the development and use of 3D printing and additive manufacturing technology. Driscoll worked with colleagues from Stony Brook University, University at Buffalo and Binghamton University on the project. $40,000 for Functional & Responsive Materials: This project will explore the feasibility of creating a "smart sensor platform" that integrates multifunctional sensing materials on a flexible substrate. Gitsov collaborated with colleagues from University at Buffalo, Binghamton University, Stony Brook University and SUNY Polytechnic Institute on the project. $15,000 for Technology: This project will facilitate online access to SUNY's informatics resources. The site will contain information about all relevant SUNY assets as well as contact information for experts who can provide further detail. Stephen Weiter, director of college libraries at ESF, is involved in this project along with professionals from the University at Buffalo, Stony Brook University, Binghamton University and Stony Brook University. SUNY Materials and Advanced Manufacturing is one of five Networks of Excellence recently established to increase research collaborations and spur commercialization activities between SUNY and industry partners in core research areas. The others are SUNY 4E (Energy, Environment, Education, Economics), SUNY Health, SUNY Brain, and SUNY Arts and Humanities. A sixth network that will focus on teaching and learning assessment is also in the developmental stages. "Whether they are advancing 3D printing, extending battery life, or increasing student interest in advanced manufacturing, SUNY campuses across the state are coming together to enhance the capacity of New York's manufacturing industry through their collective research," said SUNY Chancellor Nancy L. Zimpher. 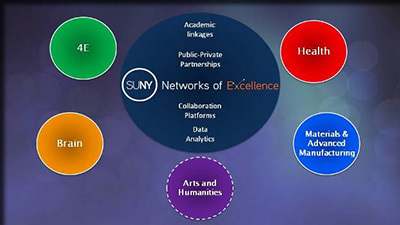 "The SUNY Networks of Excellence have quickly started to have an impact not only on the students, faculty, and researchers who participate in them but on the entire state. Congratulations to all of the project partners supported by this first round of funding."